Pension is situated at the edge of town, outside the main road. Offer homely accommodation for families and larger … More » groups. We offer 4 rooms, common bathrooms, sauna and drill hall. Accommodation is available with breakfast or half board. Guesthouse by the wood above the square in Horni Marsov. Easy access and parking for cars or caravans with electricity … More » , comfortable showers and WC in the house. Panoramic views of the church, river and mountains. Starting point for trips to Rychory mountains. Ski/cycling buses and shops in the town. 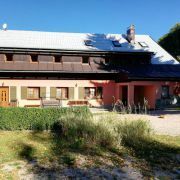 Marsovka Cottage is situated in the beautiful eastern Giant Mountains on the outskirts of Horni Marsov towards … More » Lyseciny and Alberice. 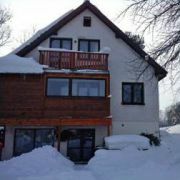 Accommodation in newly renovated and stylishly furnished cottage, which dates back to 1880. Our aim is to make you feel at home. 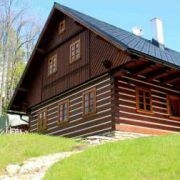 Completely new built wooden cottage is situated in Giant Mountains, in beautiful valley of Lysecinsky stream is … More » ideal place for perfect vacation in mountains. Cottage is ideal for families with children, active sports people or friends.